(The) Grove - The Grove provides an extensive selection of retail stores and restaurants that will please even the most discerning shoppers. Many of the stores veer toward the higher-end, such as Barneys New York CO-OP, Johnny Was, Michael Kors, Splendid, Nordstrom, and Theodore, though there is a sampling of affordable options including Chico's, Forever 21, Gap and J. Crew and MAC Cosmetics on-premise. Young girls will go gaga over the American Girl Place, while the flagship Apple store can entertain techies for hours. Bookworms will revel in the three-story Barnes and Noble. Unwind at restaurants like The Cheesecake Factory, The Whisper Restaurant & Lounge, Morel's French Steakhouse & Bistro and La Piazza. Farmers Market is directly adjacent. Original Farmers Market - the Farmers Market (website) was conceived when a dozen local farmers started parking their trucks on a field to sell their fresh produce to residents. Since then, the Farmers Market has retained its relaxed, open-air atmosphere and selection of fresh-from-the-farm goods, while becoming a world-class haven for gourmands, offering fare from nearly every region imaginable. The compact, maze-like space houses more than 70 stalls, stores, markets and cafes, some of which are nearly as old as the market itself. The Grove shopping district is directly adjacent. West Third Street - It may not be as well known as Rodeo Drive or Melrose Avenue, but West Third Street holds its own when it comes to hip boutiques and topnotch eateries. One of the city's hottest shopping districts, this spirited street has a loyal following among twenty- and thirty-something locals and A-list celebrities. Koreatown is located about half way between downtown Los Angeles and the Miracle Mile district. 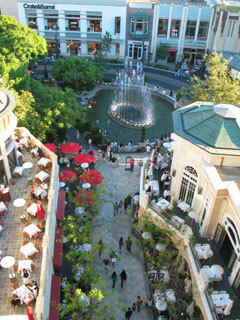 CityCenter on 6th - an indoor mall on three levels offering more than 60 shops and businesses, including a food court. 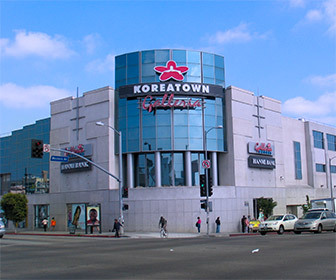 Koreatown Galleria - an indoor mall on three levels offering more than 70 shops and businesses, including the typical array of mall staples such as clothing, jewelry, and boutique shops as well as flowers, shoe repair, a large food court and more. The "anchor" of this mall is undoubtedly the Galleria Market, a grocery store where you can find all sorts of Korean goods (this is where it would be handy to be able to read Hangul characters, since many items do not have English labels). There is a parking structure with four levels of free parking, although it gets crowded on the weekends. Koreatown Plaza is near Koreatown Galleria and although a bit older, it offers a similar cultural experience. It is a three-level mall with 80 shops, including a food court and free parking.